Thanks to tax incentives from the State of Missouri, Ford will invest $400 million in its Kansas City facility to upgrade the plant and accommodate production of a yet-unnamed new vehicle, while retaining full-time employment of 3,750. Ford will invest $400 million in the Kansas City plant to install a new body shop, new tooling and other upgrades after Ford Escape production moves to Ford's Louisville Assembly Plant. Ford is investing $600 million to transform the Louisville Assembly Plant into a state-of-the-art facility, becoming Ford’s most-flexible high-volume plant in the world. When the fully transformed Louisville Assembly Plant re-opens in late 2011, it will operate on two production shifts, requiring 1,800 incremental jobs from current staffing levels to be filled through a combination of existing Ford workers and new hires. It will build the new Ford Escape. "This investment and promise of a new vehicle to be built in Kansas City reinforces Ford's commitment to U.S. manufacturing and American jobs," said Mark Fields, Ford president of The Americas, in a press release. "Investing in our plants, products and people is critical to Ford's ability to compete with the best in the business. Ford is committed to doing everything it takes to work with its partners, including the United Auto Workers, to remain competitive." 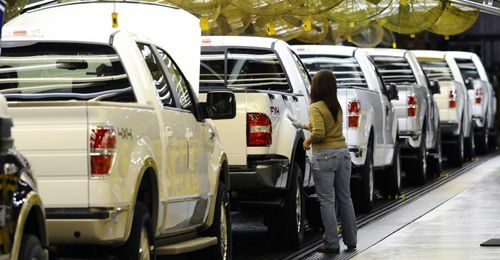 Kansas City Assembly Plant is the fourth North American facility Ford is retooling for production of new vehicles that are at the heart of an increasingly balanced lineup of cars, trucks and utilities. The new vehicle planned for the plant will be announced at a later date. The plant opened in 1951 and has approximately 3,750 employees. It currently produces the best-selling Ford F-150 on one shift (and will continue to do so) and the award-winning Ford Escape on three crews. In planning to secure Ford's future manufacturing presence in the state, Ford worked closely with Missouri Gov. Jay Nixon and the Missouri State Legislature in passage of the 2010 Missouri Manufacturing Jobs Act. This legislation provides tax incentives for certified automotive manufacturers that commit to new investments and job retention in Missouri and suppliers who create new jobs in the state.